Glen Echo’s Stretch Tech Wind Pants are water repellent, wind blocking, and heat retaining to keep you comfortable throughout all weather elements. I played all winter long and I didn't have to wear thermal underwear when I wore these pants. They run about half an inch long and this keeps your ankles warmer than other pants. 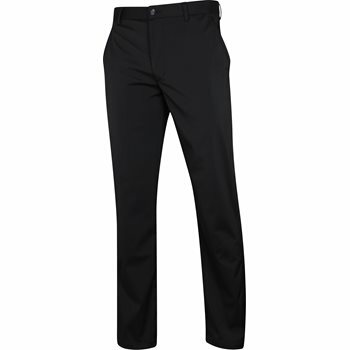 These pants are nicely constructed, have a great light fleece interior lining, a split leg at the shoe top, and are made of that very pleasing stretch fabric that works so well in golf pants. I am 5' 11&quot;, 200lb, wear a 36 -32 pant in everything else which fits perfectly. These pants however in 36-32 are the right length but were so tight in the waist I'd have to order a 40 or a 42 to fit my waist correctly - they were so far off that it makes me think the pants were mislabeled for size. I'd love to keep them or even exchange them but the waist is so far off that there is no guarantee that they will work. Too bad they will be GREAT pants for those they fit. I can't downgrade just for fit so its 4 stars I guess. I ordered the Adidas Ultimate Fall weight Pants at the same time and between the two I'd choose these by far. However neither fit well enough for me to keep them. Been looking for some time for fall weight golf pants as it gets cold pretty quick up here in Wisconsin. Great fit, price and quick delivery.